You can increase your business proposal’s success rate if you understand how evaluators determine Value For Money. Most proposal writers focus on the solution or cost. While both of these are valid, you need to examine your bid from the evaluator’s standpoint, in particular how they assess the ‘true’ cost. For example, the lowest bid does not always mean Value For Money. Let’s look at each of these and see where and how this will affect our proposal development. While these are not directly related to the total cost, you can see how they’d influence the agency awarding the contract. For example, if the project goes over schedule – and daily rates increase – the project becomes very expensive. To protect the agency, I will then take a deeper look at the items in the bid; for example, clauses in the appendix which if executed could prove very costly. Check if bidders quantify needs, schedule, and dependencies. Check if resources are required on an “ongoing” basis. Will resource be available as required at the given dates in the plan? Identify project risks identified by the bidders. Consider the quality of their presentations, their team, and their responses raised to questions at presentations. Upfront payments requires before starting. Payment schedule i.e. do they invoice every month, deliverable or per input/output. Approach to change control, e.g. if the project goes over schedule how do they propose to manage this, their approach to costing, and the daily rates will they charge. How they will charge (penalize) if the agency cannot deliver at any point. Charged for late delivery i.e. if they run over schedule and this impacts the parallel projects. Penalty points they may impose. Warranties in relation to support contracts. Daily rates changes, i.e. will they revise their rates if additional work is required? As you can see, from the agency’s point of view (i.e. the firm awarding the contract), there are many ways they can be exploited. What this means for you, as the bidder, is to write your proposal so that you repeatedly demonstrate value for money. To do this, remove ambiguity from your bid – strive for transparency – and reduce the agency’s anxiety wherever possible. The more you can demonstrate this, the more likely you are to be shortlisted. What else would you add? 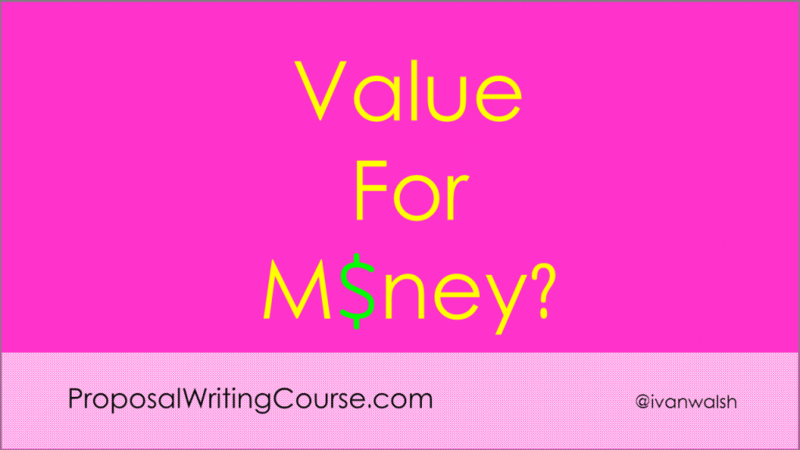 How do you demonstrate Value For Money in your proposals?